WALKING down the aisle with Shania Twain’s “From this moment” playing softly in the background was fitting for Mae Koime and groom Peter Kearsley. The song suiting the moment captured all attention, some with tears and some with smiles while the groom stood uptight ready to receive his beloved who was gliding down the aisle with her father in-law. Unfortunately Mae’s father could not be available due to circumstances beyond the family’s arrangements and it was agreed that the grooms’ father accompany the bride. Mae Koime is a household name in athletics in the country as the former women’s national record holder in the 100m track event (11.37sec). Saturday, Oct 27, 2018 is now noted down in the 35-year-olds’ dairy as the date she officially became Mae Kearsley in a wedding ceremony that took place at the Nature Park in Port Moresby. Mae met Peter two years ago in Port Moresby and naturally they fell in love. After living together for a period of time, both finally decided to tie the knot and become husband and wife. Their wedding was witnessed by their families, friends and the heavenly father above. Peter’s family from Cummins in South Australia made the trip up to Port Moresby to witness the occasion and Mae’s family attended to see their very own female icon officially become Mrs Kearsley, leaving the Koime name behind. It was an emotional moment for those that attended, especially the brides’ family. It struck them that Mae was now leaving their house and no longer going to bear the Koime name, as she walked down the aisle. With seconds ticking, the Koime name she had was slowly going to fade; it surely brought tears to their eyes. Nerves came creeping as Mae headed towards Peter, as usual in these sort of ceremonies, one could see them shaking whilst realising the significance of the moment however, both ensured to remain calm while they shared their vows and were pronounced husband and wife by the celebrant in front of hundreds. For Mae, she had come a long way as a girl growing up in one of the notorious areas of Moresby South (Kaugere) to becoming a renowned female athlete in the country and a role model to many women who dreamed to have a such a career as hers especially in sports, and of course one day find that special one to love and support them in good and bad times. Peter, the groom was described on that day by his best man as an efficient and honest man assuring the bride and her family that Mae would be well taken care of as a new member of the Kearsley family. They come from different cultures; Mae from the shanty streets of Port Moresby and Peter from the country side of South Australia. Finding each other and making that bold step to join houses was described on that day as fate fetching them together in the will of God who knows the future of all his children which included the bride and groom. Despite their different backgrounds and upbringings, their story testifies the power of love and what it can do to bring man and woman together to become one in the eyes of God. Both showed everyone the meaning of their love and affection for each other when they exchanged their vows and put a ring to their fingers. 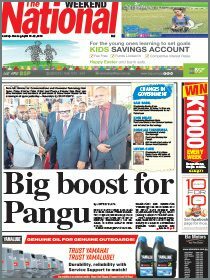 It was described as a special moment for families and friends but there were comments within the atmosphere as well indicating that it was special for PNG in some way. Many in Papua New Guinea (through sports) would know of Mae Koime now (Mae Kearsley) as a figure that has carried the flag of Papua New Guinea in athletics to major international events around the world, a great sporting ambassador indeed. 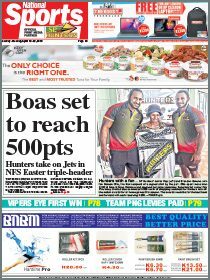 She was once described as the fastest ever female in Papua New Guinea and also Oceania’s fastest before Toea Wisil tore onto the track. She sat a national record in the 100m in the Athens Olympics in Greece (12.00) and she later broke her own record in Lae in one of the national championships. Some of her achievements for Papua New Guinea saw her winning gold in the Pacific Games in Apia (Samoa) in the 4×100 relay and silver in the women’s 100m and 200m. In the 2003 Pacific Games in Suva she won silver in the 4x400m relay and bronze in the 400m hurdles. In the Oceania Championships she won gold in 4×100 relay in Cairns (2010), won gold in Saipan (2008) in the 100m, 200m and 4×100 relay and gold in Samoa (2006) in the 100m. Mae was also privileged to be the flag bearer for Team Papua New Guinea in the 2004 Commonwealth Games in Melbourne, an honourable thing which only a few sporting greats in the country get to experience. With such fame, it was definitely beautiful to see one of the country’s great sporting role models tie a knot and venture into a new chapter of life. Her younger siblings described her as someone who dedicated her life to athletics and her talent in sport got her to receive quality education abroad. When she returned home during her breaks, she would share her adventures not only with her younger brothers and sisters but others in the community as well. She was an inspiration to many young ones and encouraged them to strive hard to achieve their ambitions. Apart from being a professional female sprinter in public, Mae’s private life was described as being mother to her siblings, the extended family and her community. Whenever a situation arose she would always step in to help out. Isaac Liri is a freelance journalist. Career tip: What will I choose?